It’s October! Cider and donuts and crunchy leaves. The colors are peaking on some trees right now here in Oregon, the brightest reds and oranges are afire on the trees. The days are still sometimes sunny and warm, but the rains have come as well, earlier than usual. The heat in my house has started turning on in the mornings. I treated myself to some really good, organic hot cocoa mix this week. It’s time to start burrowing in for the winter. 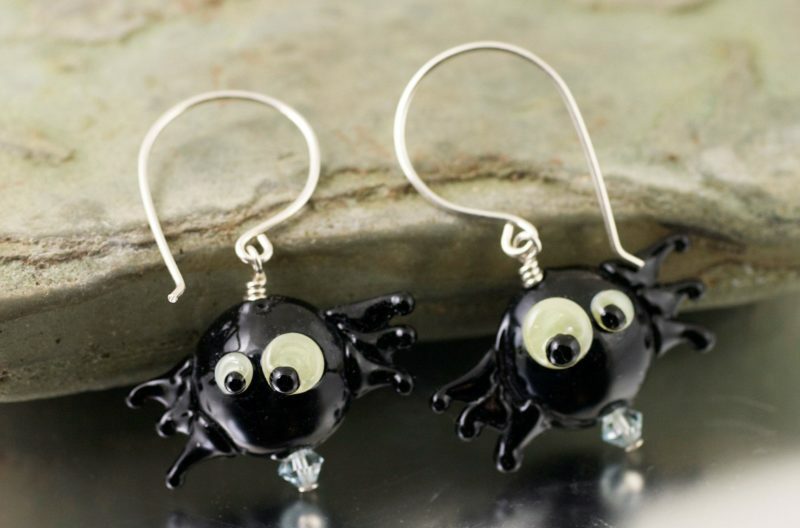 But I have been having a good time making “spooky” earrings, ghosts and bats. The bats needed some work on the wings, and I have developed them to look a lot more like wings, so that my little black critters aren’t mistaken for spiders. I can make spiders, too, and they will look truly like spiders. Fall and winter are often times of introspection for me, and this year is no different. Lots of changes, and a lot of inner growth. It keeps happening. I am repeatedly challenged to be more than I am, or at least, to dig deeper into what is me, and bring it forth to the surface. So while I am doing all that work, emotionally, mentally, even physically, it’s fun to just make cute ghosts and bats. Balance the work with laughter.